Shade the Changing Girl Vol. 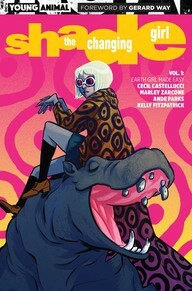 1: Earth Girl Made Easy by Cecil Castellucci, Marley Zarcone, Ande Parks, Ryan Kelly, & Kelly Fitzpatrick. The Premise from the Publisher: "Far away on the planet Meta, Loma's going nowhere fast. She's dropped out of school, dumped her boyfriend and is bored out of her mind. She longs to feel things. That's where her idol, the lunatic poet Rac Shade, and his infamous madness coat come in. Loma steals the garment and makes a break across galaxies to take up residence in a new body: Earth girl Megan Boyer. Surely everything will be better on this passionate, primitive planet with a dash of madness on her side and this human girl's easy life. Only now that she's here, Loma discovers being a teenaged Earth girl comes with its own challenges and Earth may not be everything she thought it'd be. Megan Boyer was a bully who everyone was glad was almost dead, and now Loma has to survive high school and navigate the consequences of the life she didn't live with the ever-growing and uncontrollable madness at her side. Not to mention that there are people back on her homeworld who might just want Shade's coat back" (DC). "SHADE, THE CHANGING GIRL is a part of DC's Young Animal--a four-book grassroots mature-reader imprint, creatively spearheaded by Gerard Way, bridging the gap between the DC Universe and Vertigo, and focusing on the juxtaposition between visual and thematic storytelling" (DC). My overall thoughts and review: I'm not familiar with the previous presentation of Shade, so I went into this graphic novel with no prior history. Apparently, previously, Shade was the Changing Man and in Castellucci's iteration, Shade is re-imagined as a teenage girl. It was quite confusing when it first started off because Shade steals this coat that allows her to travel across galaxies and take residence in a new body. Shade chooses the body of Megan Boyer, who is brain dead but miraculously wakes up. The reader soon learns that Megan was actually a horrible bully and now Shade is facing those consequences. She is trying to learn about what really happened the night of Megan's accident that landed her in a coma, how she was on the swim team, and who her true friends are. The art can be quite beautiful at times but I'm not a big fan of the art style to begin with. I found it really confusing to follow at times and that really slowed down my entire reading process for this graphic novel. The flip flop between earth and Shade's planet back home was incredibly confusing and it didn't take until the second issue/chapter to really learn about the jacket and how Shade stole it. The collected series, which follows issues #1-6, does resolve the mystery of the Megan arc somewhat (but what really happened that night and who did it?!?) and it appears that Shade is trying to make amends for what Megan had done which is nice since its technically not her mess to clean up. But it was incredibly unbelievable how other humans just simply accepted that Shade was now an alien in Megan's body (her parents for example) and it was hard to distinguish memories at times. Overall, I really tried to enjoy this read, but with the art style really not hooking me and the narrative confusing me more than ever, I don't think I'll continue on with this series. Disclaimer: An advanced reader's copy of the book was provided by Penguin Random House Canada in exchange for an honest review. All opinions are my own. Oh how strange! It seems like this first volume was super rushed. I hate when this happens! As a first volume, I always prefer when the characters are fully set up rather than relying on meeting them in a different series. Great review!